THE Police Service of Northern Ireland has today (17 September) launched a new crackdown to tackle street-level drug dealing across Northern Ireland. Police offers arrive for a drugs search on a domestic premises. Operation Torus is aimed to disrupt and arrest drug dealers who are involved in the sale and supply of drugs and to encourage people to report information to the Police. The Operation combines a media campaign which incorporates billboards, Facebook and washroom advertising and will run until October. 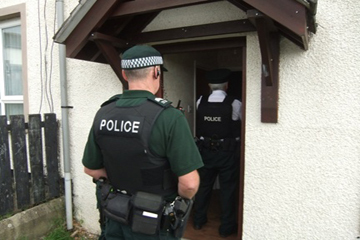 Since operational activity began on 20 August, police in C District, which incorporates North Down Ards Castlereagh and Down have conducted 86 searches, arrested 39 people seized drugs with a potential value of £7000 and £1000 cash. (These figures are as of 14 September). The types of drugs seized during the operation included cannabis, herbal cannabis, amphetamines and prescription drugs. C District police commander Chief Superintendent Nigel Grimshaw said: “I know that the issue of drugs is of concern to the local community. I want to reassure you that police take this issue very seriously. 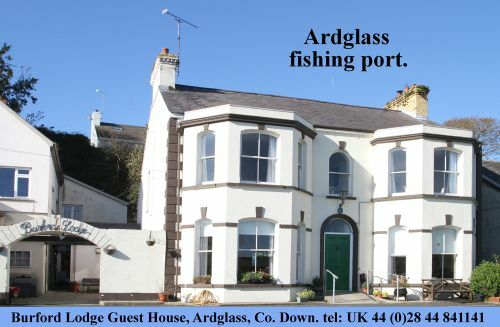 “We want to build upon the hard work of Operation Torus and we will continue to work with community groups, political representatives, churches and schools to educate young people and to raise awareness around the dangers associated with drug taking and the impact drugs can have not only on your health but on your whole life. “Young people who take illegal drugs or who misuse prescription medication may place themselves in dangerous situations or activities that they would not normally dream of doing. This type of behaviour has the potential to seriously affect the quality of life for many residents in your community. 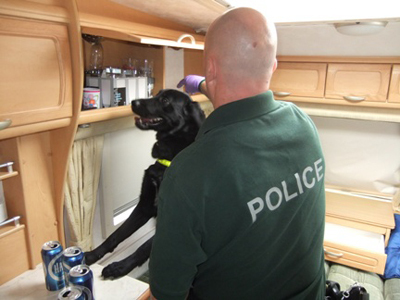 A sniffer dog looks for drugs in a caravan. “It may not only affect your health, but also your job opportunities or getting into University if you have a criminal record. “Information is crucial when we tackle drugs and I would encourage local people to contact your local police and let us know what you know about dealing in your area. The more co-operation we can get from our community the better equipped we are to disrupt the activities of drug dealing criminals who are involved in the sale and supply of drugs and bring these individuals before the courts. “With community support, we can continue to put pressure on the dealers by carrying out further targeted searches and making significant arrests.